HGTV Designer Taniya Nayak is using HG sign letters for a show she has done for The Food Network. She spruces up a barbeque restaurant's decor by the name of "Rascals" and uses the cool letters on a wall in the restaurant. She liked the unique, collected feel of the letters for a casual eatery. I met Taniya at the Country Living Fair in Columbus last September and she bought a big, yellow "N" for herself and liked it so much she thought of HG for the show. The show is set to air on The Food Network, February 2 at 10pm EST. Check it out! I'll have to check it out, I love shows like that. I loved those letters too. If yo ever run across a pink or green M&C, let me know, thanks. 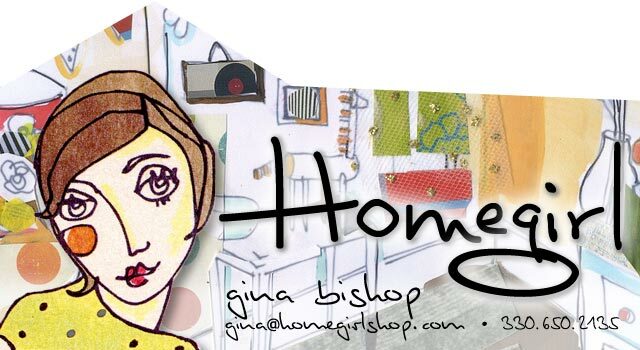 Way to go Gina....read my latest blog post if you get a chance. I mentioned you again.....thestrawberrypatchjunk.blogspot.com. Let me know if you head south anytime soon for a show...I would love to see you again! Gina, I have been following (drooling) over your blog for many many months. My dream for many years has been to have a "barn" to sell all my treasures in. How lucky you are ! I just wanted you to know I had listed you as one of my favorite blogs! Great ideas!